Comic book characters on TV? Crazy, right? Here’s what’s up in the world of TV for Wednesday, October 7. All times are Eastern. 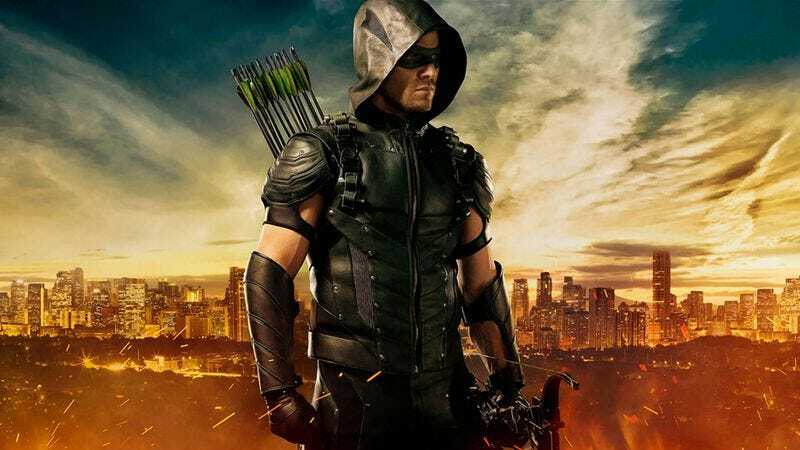 Arrow (The CW, 8 p.m.): The fourth season premiere of Arrow is titled “Green Arrow,” and we’ll be honest: Even though we were pretty disappointed by a lot of Arrow season three, we can’t deny that our nerd senses are tingling over that episode title. You see, Arrow is a show about the comic book character Green Arrow, but no one has even called him that yet. Crazy, right? Right. You get it. So, after last season’s “ride off into the sunset” finale, how is the show going to get Team Arrow back together? If you guessed “through the villainy of Neal McDonough’s Damien Darhk,” then you’re really good at guessing (and you probably also knew about that whole Green Arrow thing). Alasdair Wilkins knows a lot about comic book characters and guessing, so he can explain the Green Arrow to anyone who’s still confused. The Middle (ABC 8 p.m.) / The Goldbergs (ABC, 8:30 p.m.): You know it’s a good sign when you’re already amused by just the first part of an episode’s synopsis, and that’s exactly what we have here with The Middle: “Frankie is shocked when flannel-loving Mike decides to wear a Hawaiian shirt.” It’s ridiculous, and we love it. So, can The Goldbergs live up to that high standard? “Murray attempts to help Adam transition into adulthood by building a robot.” We’re not quite sure that’s the same as the Hawaiian shirt situation, but at the same time, we want to see how a robot is the key to puberty. Will Harris will allow it. Survivor (CBS, 8 p.m.): We’re really happy Survivor is back, and you want to know why? Unlike with Big Brother, we can get real episode synopses here. This week, in “We Got A Rat,” “a castaway’s future in the game is in jeopardy when they’re caught sending a message to another tribe.” Quick and to the point. Just how Carrie Raisler likes it. WWE NXT TakeOver: Respect (WWE Network, 8 p.m.): While the last WWE NXT TakeOver special (Brooklyn!) got the excitement going by announcing that its December event will take place in the UK, it really glossed over the fact that there would also still be a TakeOver special in October. But here it is, and it’s a pretty damn important one; not only are the women of NXT main eventing, they’re main eventing with a 30 minute Iron Man match for the NXT Women’s Championship. To the outside observer, women and wrestling may not be the best thing when put together, but tonight’s TakeOver is all about shattering those beliefs and expectations. Sasha Banks and Bayley’s NXT Women’s Championship match was arguably the best match of the last TakeOver event (and one of the best wrestling matches of the year), and now they’re getting the main event spot they truly deserve with tonight’s TakeOver. LaToya Ferguson will probably be sobbing tears of joy throughout the match, but she promises to write a competent review. American Horror Story: Hotel (FX, 10 p.m.): It’s time to check in and… You know the deal with AHS and/or Ryan Murphy at this point. Emily L. Stephens sure does. You’re The Worst (FXX, 10:30 p.m.): After last week’s episode ending, we’re extremely frustrated that the synopsis for this week’s episode, “We Can Do Better Than This,” doesn’t address it at all. Stupid spoiler control. But the synopsis does give us something to look forward to in the laughs department, as “Gretchen and Lindsay discover all they do is talk about men and set out to change the status-quo.” Meanwhile, Jimmy is still having some issues with his writing, and Edgar finds himself connecting (wink wink) with his improv teacher, Dorothy. That all sounds nice, but Vikram Murthi (and the rest of us) just want to know what the hell Gretchen was doing at the end of last week’s episode! Casual (Hulu, 3:01 a.m.): “A comedy series about a bachelor brother and his newly divorced sister living under one roof again. Together, they coach each other through the crazy world of dating while raising her teenage daughter.” So, ignoring the fact that this series synopsis mentions “the crazy world” of anything, this new Hulu series from Jason Reitman and Liz Tigelaar stars Michaela Watkins, which is good enough for us. Frances Conroy is also a part of the cast, free from Ryan Murphy and free to enter our hearts once again. Kevin From Work (ABC Family, 8 p.m.): Remember that time ABC Family (soon to be… Freeform?) decided to skip Kevin From Work for a week, instead giving us a double dose of Young & Also From Work? Well we now have a reason for such decision-making, as the first season finale is a one hour (you know, two episodes) situation. That means no Young & One Hour this week. Please remain calm. Rosewood (Fox, 8 p.m.): This week’s Rosewood’s take a play out of Tyler Perry’s book with its episode title, “Have-Nots & Hematomas.” You see, Tyler Perry has a TV series called The Haves & The Have Nots. We were comparing Rosewood’s Bones-ian episode titling process with a Tyler Perry show’s very existence. The Mysteries Of Laura (NBC, 8 p.m.): “When a technology wunderkind is murdered in a seemingly impenetrable high-security building, Laura and team must unravel the puzzling murder before someone steals the victim’s billion-dollar ideas.” We’re not trying to tell The Mysteries Of Laura how to mom cop—or even cop mom—but with the exception of the whole murder thing, this episode is kind of the plot of the first Charlie’s Angels movie. Plus, Gabriel Mann guest stars in this episode, so we’re going into this with both Charlie’s Angels AND Josie And The Pussycats on the brain. Thanks a lot, Laura! Criminal Minds (CBS, 9 p.m.): Sarin gas! Property Brothers (HGTV, 9 p.m.): We hear that people are really into this show, and with it heading into its eighth season, we guess that’s true. Law & Order: Special Victims Unit (NBC, 9 p.m.): Whoopi Goldberg guest stars on this week’s SVU, and while that probably means a lot of things, it saddens us to know it won’t mean the same thing as that time she guest starred on 666 Park Avenue. When she did that, she ended it all by transforming into a bunch (a flock? a Whoopi!?) of doves. If we see anything like that on SVU, we’ll let you know, every single week. BET Special: Who Got The Juice? The O.J. Simpson Trial 20 Years Later (BET, 10 p.m.): Here’s to 20 more years of obsessing over the indirect source material for How To Get Away With Murder. Code Black (CBS, 10 p.m.): Episode two of Code Black is titled “We Plug Holes.” Code Black may end up being our favorite new show. Jay Leno’s Garage (CNBC, 10 p.m.): We’re not quite sure if you’re aware of this, but Jay Leno loves cars. It’s the only thing he loves more than Fozzie Bear’s jokes and stolen candy dishes. Somehow, CNBC learned this fact (we’ll assume it happened like that scene in Batman Forever), and they decided to center a show around it. The Ultimate Fighter (FS1, 10 p.m.): We’ve been listening to old episodes of The Reality SHOW Show podcast, and as a result, we’re feeling a little guilty for not mentioning The Ultimate Fighter before in these write-ups. Now, the guilt is gone. Phew. Are You The One? (MTV, 10 p.m.): You know Kiki, right? Of course you do. Well she’s moving in on Chuck, which Hannah really doesn’t like. That’s such a Kiki move, and we can’t believe it took three episodes for her to try it. Sigh. Kiki. Chicago P.D. (NBC, 10 p.m.): “The death of an eight-year-old boy sets off an investigation full of unlikely twists and turns.” Surely the episode will be a little more than that description, so just imagine the usual Chicago P.D. grittiness on top of all that. What Could Possibly Go Wrong? (Science, 10 p.m.): And so ends the second season of a series all about just how much things could go wrong. Nashville (ABC, 10 p.m.): Eek. In case you were wondering about Scarlett’s mother, Beverly, the synopsis for this week’s episode shines a little light on that: She’s brain dead now. So, to life support or not to life support—that is the question. Watch What Happens: Live (Bravo, 11 p.m.): Typically, we don’t mention Watch What Happens: Live, but how can we not when Buffy Summers herself, Sarah Michelle Gellar, is set to appear? If nothing else, it means Kayla Kumari Upadhyaya can’t say we didn’t let her know about this. Fletch / Fletch Lives (VH1 Classic, 6 / 8 p.m.): VH1 Classic has a double feature option, so if you want a double dose of Chevy Chase tonight, here it is.